Trying to find a universal meaning to the existence of life can be difficult. There are people who say ‘we are here to only live, laugh and love,’ while there are others who believe that there is no meaning at all. Yet another group believes that our purpose is to find our own meaning through procreation. What if the meaning of life can be found stitched into the very fabric of the universe? What if the meaning of life isn’t a distinct idea applied to individuals only? It’s something that requires all species to strive together for a greater purpose — a purpose involving each one of us, every man, woman and child — that transforms humanity as a whole. If we could achieve it, then the purpose we are referring to could affirm the Great Filter theory: a theory that explains why we have never encountered an extra-terrestrial life form. Let us imagine life to be moving through a series of stages, with certain evolutionary leaps so that species may develop, civilisations advance, and intelligence and awareness grow. Many life forms on other planets might have already achieved these stages, but only a few ever pass the great filter. The great filter is the ultimate future stage: the one that decides if a species will continue or be extinguished. It is beyond our comprehension what this stage may entail. Whatever it may be, it offers the species a potential to either develop into an established one or get wiped out. Now, since this stage acts as a bottleneck, it would explain why in a universe with so much potential for life, we have yet to meet another civilisation; more so perhaps, we are yet to pass the great filter and become one of the few intergalactic species. It may well be that we have passed the filter and are now waiting for other species to catch up. 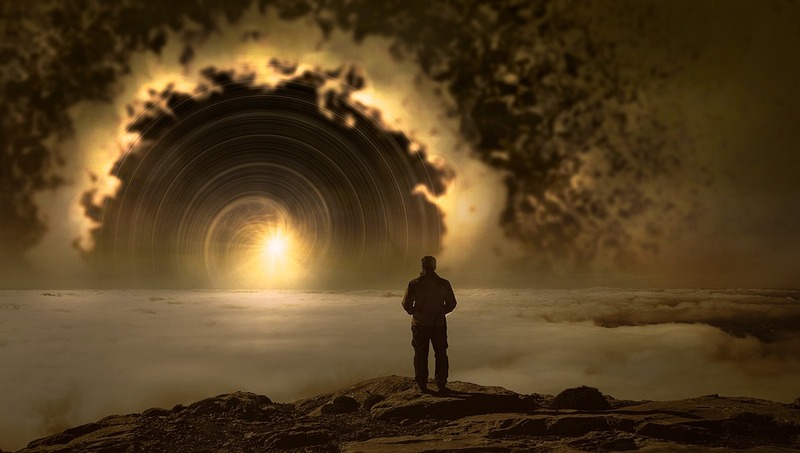 There is also a third possibility that right now, in this moment in time, we are existing in the great filter and that humankind’s entire life purpose will be accomplished or, the opposite may happen, on our imminent ‘day of judgement’. There’s is another universe-based theory for the meaning of life. It is called the Transaction Hypothesis because this idea suggests that the meaning of life is for a civilisation to collectively move beyond their current reality — towards a higher state. This analysis assumes that any life form, which evolves into a more complex being, should continue to do so indefinitely. It also emphasises the idea that as time passes on, the time it takes to develop will get shorter. Eventually, a being will be able to interact with the universe on the quantum level or lower, thereby building with it the ability to manipulate time, space, energy, matter, and reality. When a civilisation reaches such a stage, Transaction Hypothesis claims, we might use something like a black hole to take our race to a new level of existence. A place they call inner space. Here everything is super dense, ultra small, and highly productive. Let us see if we can find a more beautiful and less crazy theory instead. Throughout reality, the conversion and dissipation of energy is one of the most basic attributes of our universe. Stars, planets, and life forms all need energy to form and exist. So if all the energy is dissipated far apart, the universe as we know would fall into disorder and die in a process known as increasing entropy. It is similar to when you make a mug of hot coffee and it eventually loses its warmth. That’s the energy from your daily routine, dissipating throughout the universe. However, from a different perspective, some people prefer to microwave their coffee instead of making fresh coffee. This process too gives us useful insights into the meaning of life. In doing so, we are transferring energy back into our coffee. Keeping the coffee warm, in itself mimics the supposed purpose of life. Humans, ants, weasels, trees and pelicans all use energy to exist. We resist entropy thus trying to keep energy in an orderly and useful state. All life forms follow this norm. Ergo, the meaning of life in relation to the universe is to balance it and keep it alive. The universe provides us with energy and we reciprocate in gratitude — although, some people would argue that this is more of a purpose than a meaning, a characteristic of life, and not something to base our entire existence on.